Trade unions have warned that the prospect of no work coming to Fife from two major Scottish offshore renewables projects would be ‘an absolute scandal’. The Moray East and Kincardine offshore wind farm projects have a total value of around £2.8 billion and the Canadian company DF Barnes, brought in by the Scottish government last year to acquire the BiFab yards at Methil and Burntisland in Fife, and Arnish in the Western Isles, has been actively pursuing contracts from both. However, the fabrication work for five platforms supporting the Kincardine project have been awarded by procurement firm Cobra Wind International to the Spanish state shipbuilder Nevantia. The Moray East project procurement firm GeoSea DEME has awarded contracts for one hundred turbine jackets to UAE fabricator Lamprell and Belgian steel constructor Smulders. GMB and Unite understand that DF Barnes remains in negotiations to secure a portion of the fabrications work from the contracts allocated to both Smulders and Nevantia. 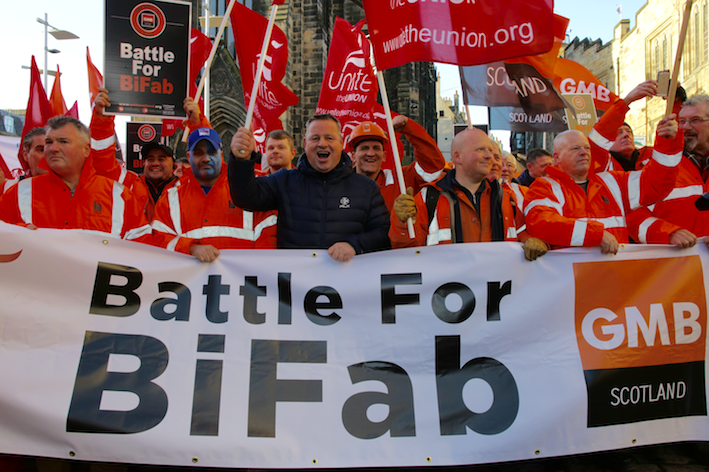 In a joint statement, GMB Scotland Secretary Gary Smith and Unite Scotland Secretary Pat Rafferty said: “There is a real possibility the yards in Fife could end up with nothing from the Moray East and Kincardine projects, which would be an absolute scandal. “We believe DF Barnes and the Scottish Government are fighting hard to secure contracts but they are trying to negotiate their way through a spaghetti bowl of vested interest groups with established supply chains of preference. “The truth is that state funded European energy and engineering firms, backed by Far East finance and Middle East sovereign wealth funds, are carving-up thousands of jobs and billions of pounds from our renewables sector. “To working class communities in Burntisland and Methil this doesn’t look anything like a just transition or a green jobs revolution – it looks like a future that’s heavily rigged against their hopes for employment and prosperity.